Philosopher and educational reformer Sir Henry Jones was born in this cottage, called Y Cwm, on 30 November 1852. The building has been a museum since 1934. After leaving school aged 12, Henry worked with his father, the village shoemaker, by day. He was encouraged to study, and “working at my books... throughout the small hours and till morning came” he won a scholarship to train as a teacher. He eventually became Professor of Moral Philosophy at Glasgow University. Henry’s work as a philosopher and teacher was greatly influenced by the shoemaker's workshop and life in his home village. He never forgot his humble origins and worked hard to improve the education system in Wales. 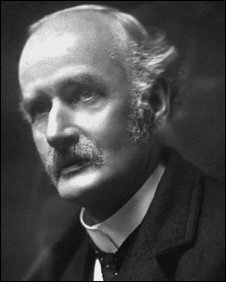 His campaigning led to the Welsh Intermediate Education Act 1889, which enabled young people whose families could not afford private education to continue their schooling after the primary stage. He was a key figure in the development of university education in Wales and helped to establish the University College of North Wales, in Bangor, in 1884. He was its first Professor of Logic, Philosophy and Political Economy. One of his sons, Elias, was later registrar there, after writing a best-selling account of Turkish captivity in the First World War. Another son was killed in that war. Henry was knighted in 1912 and made a Companion of Honour in 1922. After his death the same year, a memorial fund was established. His childhood home was opened as a museum, where you can still visit the shoemaker's workshop and the tiny kitchen and bedroom where Henry and his family worked and lived. You can also find out more about the chapel, the school and life in a remote upland village – “the sort of home from which most that is best in Wales has sprung,” in Sir Henry’s view. The museum has a free interactive audio tour, featuring film footage, photographs and games.